SkoolApp provides a fully integrated mobile app for schools and parents to have all the communication in a well organised form and kept consolidated at one place to be referenced anytime, anywhere, on the go. It integrates not only with SkoolApp’s own ERP, but also with your existing ERP or School Management solutions. 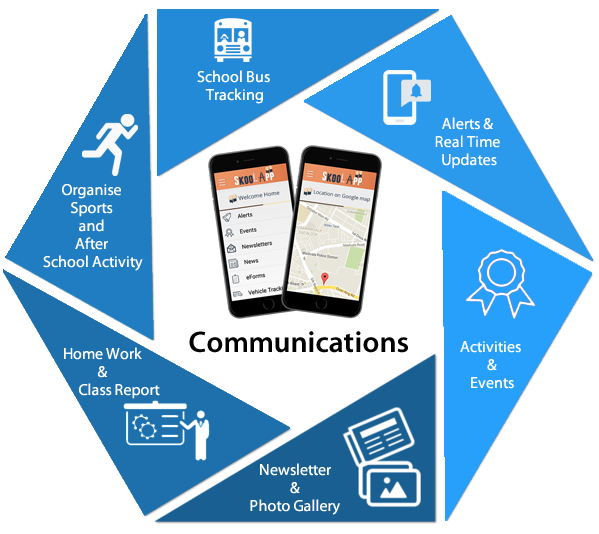 School administration can post Alerts, Newsletters, Images and Consent Forms in real time to parents just using one SkoolApp either be in office or ON the GO on, without using multiple softwares and utilities. Parents will receive all information ON the GO on the SkoolApp, without going to multiple places. In the same way, Students and Parents can submit Leave Application, Address Change Information and Consent Form via SkoolApp without having to use paper and printer and they will be received by School Administration immediately. Class teachers can post Homework, Assignments, Class Notes, Attendance, PTM schedules and Children’s Performance Reports in real time to parents. All the information is kept safely to be re-used for subsequent sessions. Parents can keep a track of all these in most convenient way and refer to it anytime in future. It is very fulfilling for parents to be engaged on a daily basis without feeling missed in their children’s education journey. School administration can publish the schedule of all School Events, Sports Schedules, Vacations, and Special Days. All these can be published specifically to the relevant classes and groups very easily using SkoolApp. Parents will receive them in real time and will be able to save them in their personal or work calendars. This integration with their work or personal calendar enables them to remember these dates which are important to them as well as their children. School Administration can publish all reference documents such as School Policies, Study Preparation Guidelines, Parents Information Document, and Campus Information. These documents are organised and made available to parents in a very easily accessible form on SkoolApp. Parents have the ability to access these documents anytime, anywhere without having to search them in the emails or school website. At the click of a button on SkoolApp these documents can be read and printed as needed. Availability of Sports Coaching, Tuitions and After School Care programs can be published on SkoolApp making it a complete ecosystem for parents. Parents can subscribe to these services as needed by them in the most convenient form. School administration can create as many bus routes as they have in the school and assign students to them. These bus routes can be used by bus drives via our SkoolApp Tracking app allowing parents and school administration to track the location of bus. SkoolApp provides a fully integrated school management ERP for schools, guardians, students and alumni to have all in one real time, up to date and secured solution with 2 factor authentication. The solution provides modern look dashboard, easy setup, various reports and daily task list in order to improve efficiency at all levels. Below is the summary of key modules. This module covers management of complete lifecycle of a student starting from First Visit of School or School Website to Alumni Status. School administration will have capability to setup and manage all the activities required to maintain the student in their school in a very convenient and easy way. Student and parents will have all information available to them in real time with the capability to request extra information such as certificates and mark sheets. With the click of a button students and parents can see a 360° view of their status and performance in school. School administration and teachers will have great capability to setup and manage detailed level curriculum including syllabus, courses, subjects and its delivery to students including management of scheduling, classes, exams, assessment and report cards. Students and parents will have real time information and notifications of classes, due and overdue assignments, and current workload information. Students can download and submit notes and assignments online. Optionally, students can also confirm the participation in a class to give teachers a heads up on the count of children attending the class. This modules gives School administration and accounts departments a complete freedom from paper based accounts and fees administration. They can easily setup and manage staff, leaves, attendance, salary, allowances, deductions, fees, cash register, daily expense register, bank reconciliation and a lot of reports within SkoolApp. Staff, students and parents will have real time and upto date financial information available to them via SkoolApp with a click of a button. They will also receive overdue payment reminders as applicable and setup by school. With the click of a button they can print salary slips and fee payments receipts. 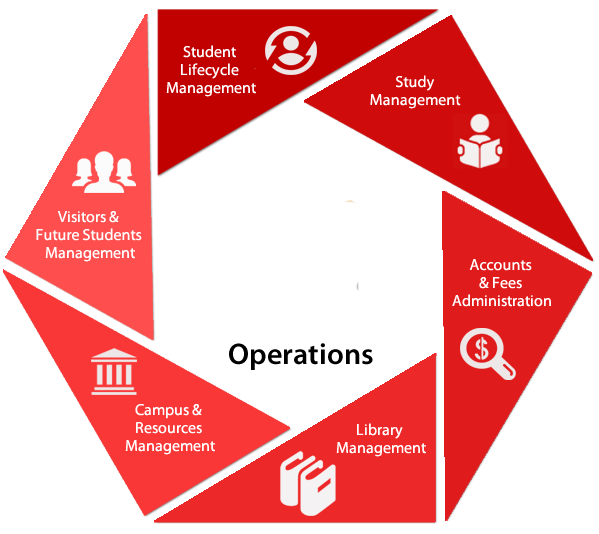 This module provides capability to manage library stock, issues, returns, requests, late fee, RFID integration and various reports. Parents and students can find the books and resources, reserve them and keep a track of their borrowings and resource usage. School administration can setup and manage the buildings, locations, classes, capacities, and related resources such as projectors, printers, labs, equipments, inventory and their availability. Teachers, parents and student will have real time information on the availability of these resources and can book as needed. This module provides capability to track and manage school visitors including online enquiries from school websites. In addition it also help in organising alumni events as well as fund raising campaigns for school. Visitors and alumni receive real time information of their visits and events. All the information is fully secured with our 2 factor authentication mechanism allowing only YOU to access YOUR or PUBLIC INFORMATION.